I always wanted a beach wedding and this cake would be perfect for your beach wedding. Heck it would be perfect at your winter wedding if you had a beach theme! 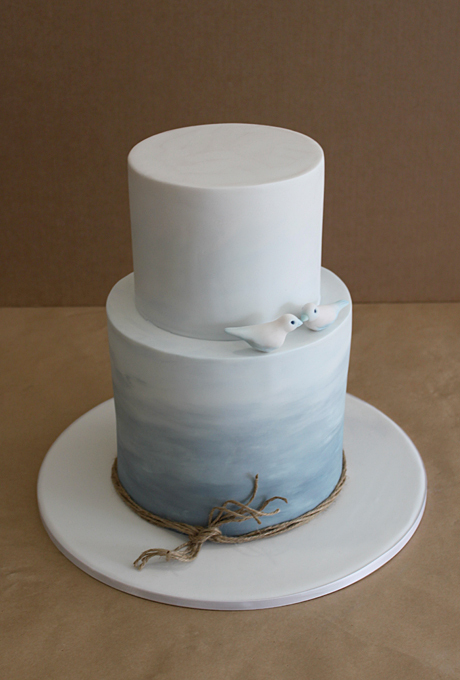 The cake was hand painted to create the watercolor look and the result is stunning. The twine at the bottom tier is that perfect embellishment – it really gives off a beach vibe! And those adorable sugar lovebirds? You don’t need anything else to make this cake perfect. This cake was created by Faye Cahill Cake Design. You can find the cake here.